Sluggish and simplistic, Assassin’s Creed II may be the most artless work of art ever to emerge from the Renaissance. I've always imagined the Renaissance to be a splendid time when the Western world went from drab to spectacular. The flame of humanism was rekindled and the Dark Ages were illuminated. As Woody Allen joked, suddenly we were all painting. One of the great breakthroughs in visual arts that came from the Renaissance is the mastery of perspective — the ability to represent three-dimensional distance on a flat surface. Half a millennium later, videogames rely on this principle to give their virtual worlds the illusion of space. 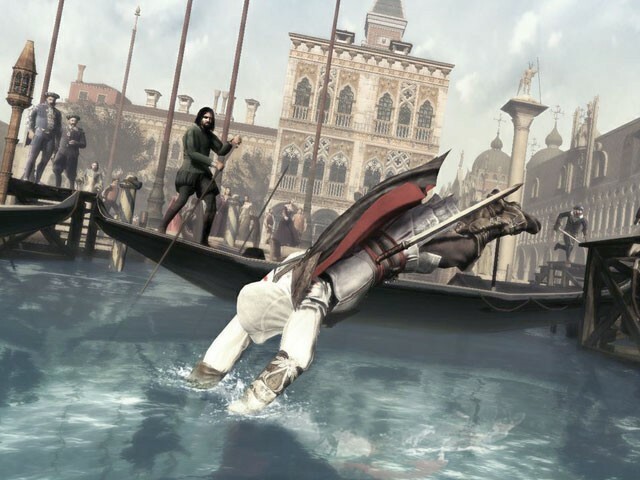 But Assassin’s Creed II seems intent on erasing depth from its environments. City streets and canals rarely reveal more than a sliver of the scene that’s around the corner. This is probably a design decision to allow the computer to focus on depicting the objects close at hand. But both the Xbox 360 and the PlayStation 3 are capable of rendering details in long perspective — games like Halo 3 and Resistance: Fall of Man are stunning demonstrations of what is known as “draw-distance.” In Assassin’s Creed II, even the close distances are poorly drawn, with trees and citizens suddenly popping into place when I enter even the tiniest piazza. The cities, in true Renaissance fashion, are jammed with people from all walks of life: clergy, hookers — er, courtesans — nobles and merchants hawking fresh prosciutto. Even when the sun goes down (a dangerous time, according to the game’s historical notes), the crowds persist. But instead of the expressive tangle of bodies that Michelangelo made famous, the streets are clogged with an anonymous, churning mass of rough-hewn, interchangeable faces and figures. It’s a pretty indistinct population for a period in history when artists began to represent people as individuals. THE GOOD: At least combat is as lovely as Renaissance bloodshed should be, and Ezio, the game’s titular killer, responds to my commands like a trained swordsman, easily countering his enemies’ swipes and thrusts. If I watch closely and time my actions well, I can even take advantage of his foe’s errors to execute some spectacular executions. THE BAD: Like its predecessor, Assassin’s Creed II has a repetitive main quest that is distended with filler — street races, covert stalking missions and simplistic jumping puzzles to remove wanted posters (from windowless second-story walls, of all places). And the parcour-like climbing and leaping that is the game’s trademark action is slower and clumsier than ever, with Ezio inching up walls, then rappelling backwards when he can’t find another handhold. THE BOTTOM LINE: Sluggish and simplistic, Assassin’s Creed II may be the most artless work of art ever to emerge from the Renaissance.